Introduction: Body mass index (BMI) has been used as one of the most reliable anthropometric indices of obesity. However, laparoscopic surgical techniques may be influenced by intra-abdominal anatomic and physical conditions. It has been suggested that visceral obesity, indicating an altered intra-abdominal environment, may be more practical for the assessment of laparoscopic surgery compared with BMI. 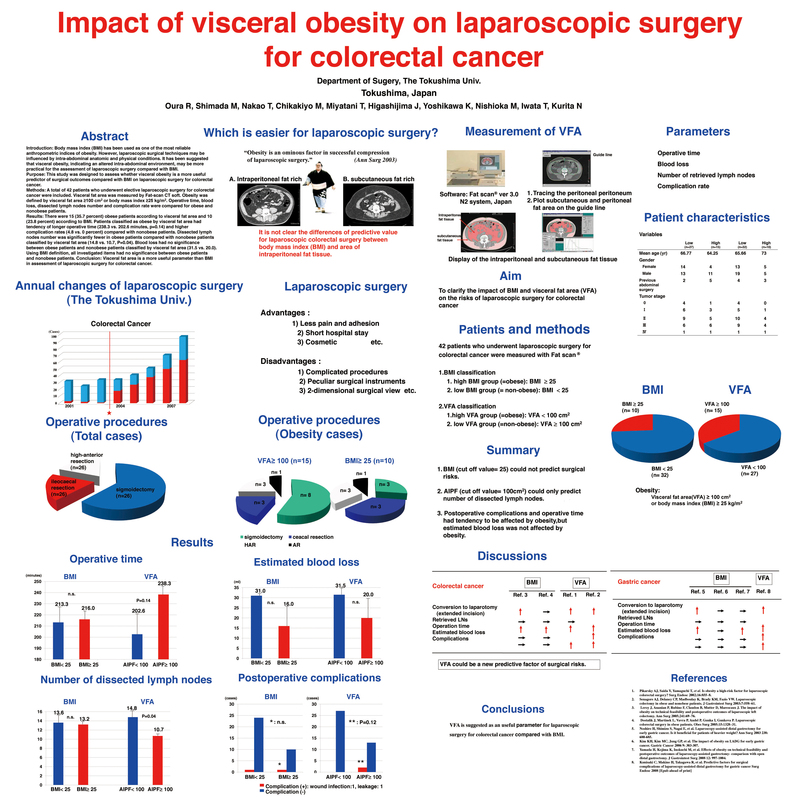 Purpose: This study was designed to assess whether visceral obesity is a more useful predictor of surgical outcomes compared with BMI on laparoscopic surgery for colorectal cancer. Methods: A total of 42 patients who underwent elective laparoscopic surgery for colorectal cancer were included. Visceral fat area was measured by Fat-scan CT soft. Obesity was defined by visceral fat area ≥100 cm2 or body mass index ≥25 kg/m2. Operative time, blood loss, dissected lymph nodes number and complication rate were compared for obese and nonobese patients. Results: There were 15 (35.7 percent) obese patients according to visceral fat area and 10 (23.8 percent) according to BMI. Patients classified as obese by visceral fat area had tendency of longer operative time (238.3 vs. 202.6 minutes, p=0.14) and higher complication rates (4.8 vs. 0 percent) compared with nonobese patients. Dissected lymph nodes number was significantly fewer in obese patients compared with nonobese patients classified by visceral fat area (14.8 vs. 10.7, P=0.04). Blood loss had no significance between obese patients and nonobese patients classified by visceral fat area (31.5 vs. 20.0). Using BMI definition, all investigated items had no significance between obese patients and nonobese patients. Conclusion: Visceral fat area is a more useful parameter than BMI in assessment of laparoscopic surgery for colorectal cancer.